Hi everyone, and welcome back to the blog. Barbara here with some more stamping fun. Well, another month is almost over, and Fall is upon us, although the 90˚ temperatures here would not give any indication of that happening. But, happen it will. In the meantime, I still have these beautiful colors in my mind's eye, and I could not be more pleased with how this sweet card turned out. 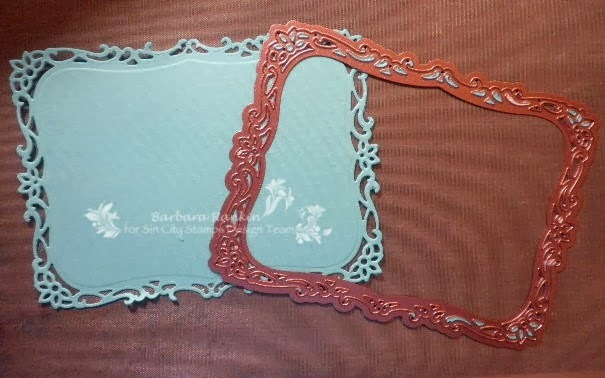 Cut specialty stamping paper to 4-1/4" x 5-1/2". Spray with the Creme de Rouge. Allow to dry. Stamp and emboss rosette hearts background with Versamark and clear embossing powder. Mist with Tuscan Sun and Dragonfly. Allow to dry. Cut aqua CS with the Decorative Labels Eight die. 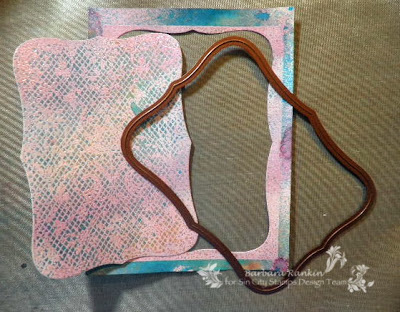 Center and cut stamped background with Labels Eight die. Adhere stamped background to aqua die cut. 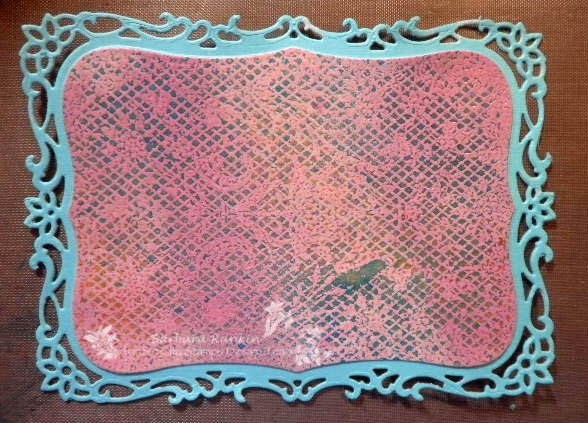 Trim pink CS to 9" x 6-1/2" to form an A6 (4-1/2" x 6") size card. Round outer corners. Adhere stamped, die cut background to center of card front. 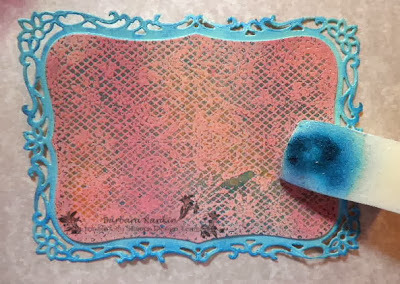 I spritzed a makeup sponge with a bit of the Dragonfly mist and added it to the decorative aqua edge. I think it brought the colors closer, and I love the color variation. 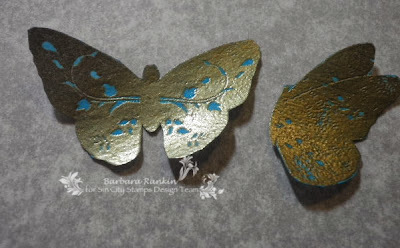 Stamp and gold emboss two butterflies from For The Love of Butterflies set using Gold Encore ink. I stamped these onto a scrap of cloudy vellum, cut them out, and then added a spritz of Dragonfly mist. 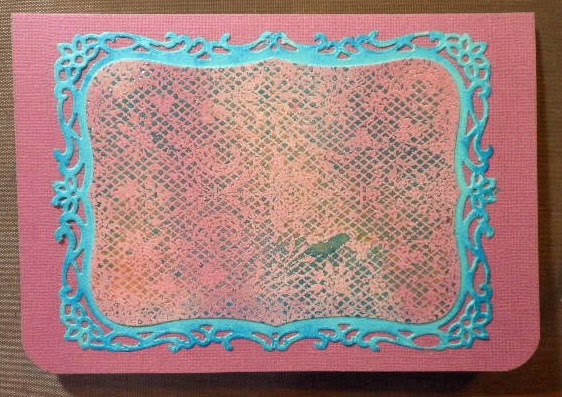 This gave that pretty blue color between the gold embossing. 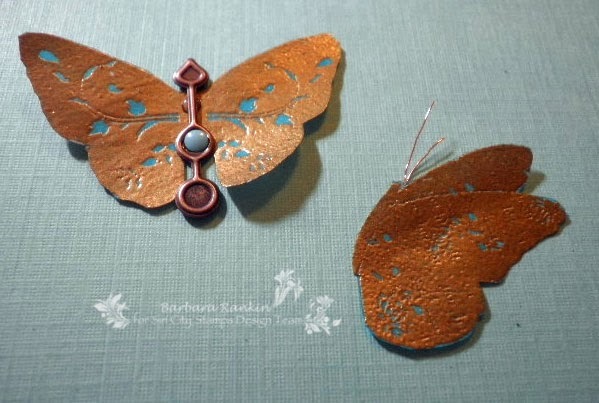 And because I stamped onto vellum, the color shows off beautifully when light passes through the wings. I don't think it will show up in the photos, but it really is a pretty effect for such tiny images. Instead of trying to fussy cut antennae on a butterfly, I prefer to add a bit of fine gauge wire to the back of my butterflies to represent their antennae. 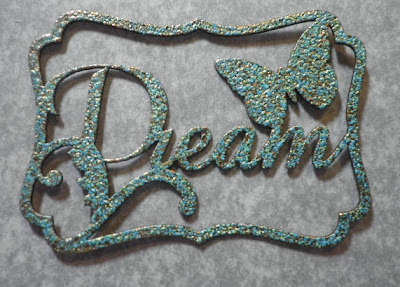 I decided to do this for the side ways butterfly, but chose a spinner for the body on the full one. I really like that look. I usually like to use pen nibs, but this butterfly is on the small, delicate side, so I thought the spinner looked more like the right size for this sweet little butterfly. 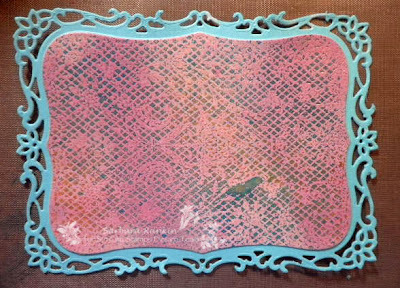 I also added a tiny metal accent in blue over the hole where the brad would have otherwise gone. 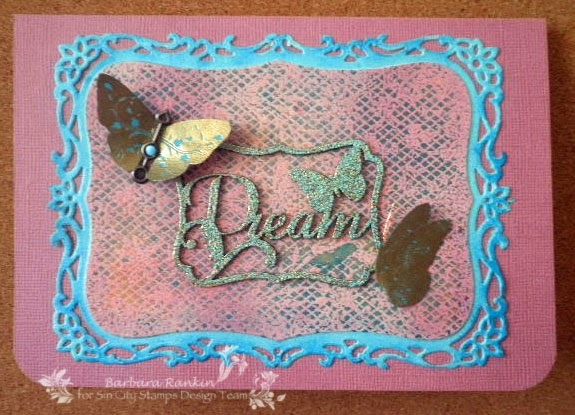 Next, I used the Dream frame from Gina's Designs, inked it with Gold Encore metallic ink, and embossed with Verdigris embossing powder. Because I used the gold ink underneath the EP, it came to the surface and gave this beautiful gold patina on the chipboard. I really love how that turned out. Here is another look at the finished card. 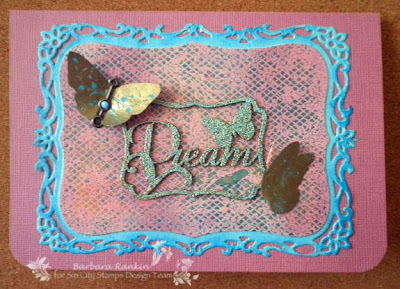 Once again, I really love the feminine look of this card, with the vintage feel of the lacy die cut, and delicacy of the sweet little butterflies. I especially love how the stamped background turned out for this particular card, but can you see the possibilities? No matter how many times you follow these steps to make it, it will never look the same. And just imagine the color possibilites! Endless!! I hope I have inspired you to try some background stamps with your color mists and see what beautiful "prints" you, too, can create. 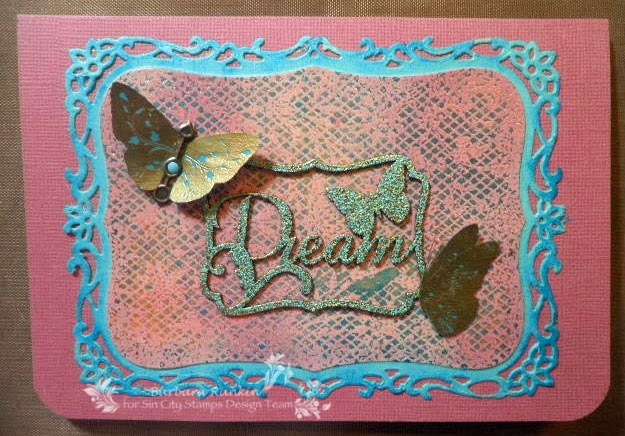 In addition to Terri Sproul, we have a couple of new stamp designers, Pam Bray and Peg Rounds, who are coming up with some beautiful images for us to play with. So check out the Sin City Stamps online store for the latest stamp releases. And while you are there, check out the Sin City Stamps blog to see how the DT is using these stamps as they are released. Oh, and don't forget to mark your calendars for our Fall/Halloween Blog Hop on the 12th of October. There will be fun, inspiration, and giveaways. I hope you will join us then. 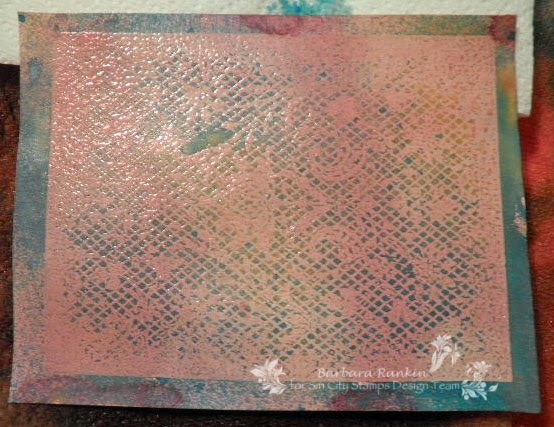 Thanks so much for stopping by, and as always, have a wonderful weekend, and make some time for stamping. Beautiful Barbara! 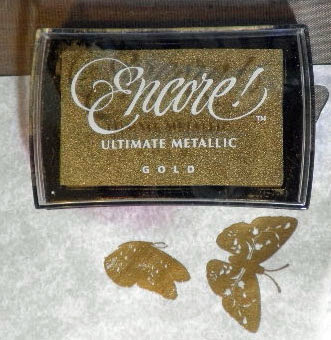 I love the gold on the butterflies!! Excellent tutorial!! -It's stunning I totally love that background. Funny I thought I had been here already and left a comments but when I just saw this is the FB group, I thought I better check, and hey I obviously didn't. So sorry as I really like your card! !